A short fun trip that is as varied as it is scenic, beginning on a meandering creek-like river through a floodplain, entering a huge lake, continuing as a swift-flowing narrow river through an attractive town and its public parks, and finally finishing at a second, smaller lake – this outing on one of our favorite rivers will be enjoyed by all. ≈ 2′ per mile between Highway 83 to Lake Nagawicka. ≈ 8′ per mile between Lakes Nagawicka and Upper Nemahbin. We strongly recommend this level to avoid scraping in the shallows. Below 50 cfs will be too low and too frustrating. Time: Put in at 12:00p. Out at 2:10p. Wildlife: Swans, sandhill cranes, mergansers, koots, geese, turtles, a great blue heron, an owl and an albino squirrel. Almost two years to the day, we paddled a trip on the upper Bark River that ended at Highway 83. Ever since then and reading The Bark River Chronicles by Milton Bates, a delightful and fascinating book about the Bark River and its human/geologic history, we’ve wanted to continue our sequential precedent. So we put in where we took out last year and continued down to the public boat launch at Upper Nemahbin Lake, immediately next to the westbound I-94 bridge. Putting-in at Highway 83 is not exactly ideal, but it’s totally doable. (Well, so we thought. See below under “Didn’t Like.”) The traffic on the road is steady, but the shoulder is wide enough to pull off the road for a bit. And the gradient from the road to the water is not crazy-steep. It’s only a half-mile from Highway 83 to Nagawicka Road, but this section is totally secluded and feels wild. It’s a hardwood floodplain, but its relatively isolated setting is quite engaging. After Nagawicka Road – where the USGS gauge is stationed, incidentally – houses line both banks all the way to the inlet of the big lake. Lake Nagawicka is huge and quite popular on summertime weekends. Depending on the wind and your own paddling druthers, you may wish to hug the shoreline to reach the outlet on the opposite shore or just make a beeline across the big lake. If you thought of the lake as a clock, the inlet is at 1 o’clock. The most direct route is counterclockwise. If sharing the lake with loud motors, be they boats or Jet-Skis, is not your cup of tea, then you’ll want to do this trip in spring, autumn, or on summer weekdays. Most of the lakeshore is girded with development. The exception is the north end of the lake, which is kind of wild and quite attractive. The outlet is located at the dam in downtown Delafield. Again thinking of the lake as a clock, the outlet/dam is at 8 o’clock. Portaging around the dam in downtown Delafield is super-easy, although there really is no designated spot to put-in again. Just find somewhere away enough from the discharge current but not so far as to schlep a long distance. From the dam it’s about 1.3 miles to the next lake, Upper Nemahbin. We don’t know precisely what the elevation drop is between the two lakes, but it’s probably a good ten feet, for the current is pretty peppy. Indeed, there are two reputable Class I+ rapids, the latter at a former mill (and site of a recent contentious lawsuit). Public land comprises practically both banks in this mile – parks, for the most part, one of which celebrates the interesting history of the Cushing Family, a trio of sons who fought in the Civil War. While this “strip” of river isn’t as secluded as the first one (from Highway 83 to Nagawicka Road), the pretty wetlands environment and exciting current make it equally excellent. The novelty of this trip alone is pretty cool: river-lake-river-lake. And even though we’re not the biggest fans of paddling lakes, Nagawicka can be quite fun. For one, it’s big, so if it’s windy, there’ll be some waves. For another, the water clarity was spectacular (probably cloudier though in summer), and it’s surrounded by gentle glacial hills. The northern tip of the lake is almost entirely undeveloped. A narrow passage connects it to the main body, so it has a cool hidden-in-plain-sight feel to it. It was easily accessible in early April, but it would be a tougher slog later in summer, as it will be shallower and more prone to aquatic weeds. Prior to that, however, the skimpy half-mile from Highway 83 to Nagawicka Road is quite pretty, intimate, and engaging. It’s still a marvel that pockets of ecosystems seem to co-exist in the most developed per capita part of the state. The funnest portion of this trip is definitely through Delafield. While only a mile-and-change long, the many riffles, clear water, attractive surroundings, and actual rapids are just an absolute blast. It’s always cool to see one singular river “behave” so differently on a single trip. OK, to be fair, there were already two downed trees about 8’ apart from one another only 25 yards from the Highway 83 bridge. Fortunately, the banks here are dry and low, so putting-in after the deadfall is easy. But A) it does mean additional schlepping from the bridge and B) it’s hardly the most welcoming way to begin a trip. That said, there was only one other downed tree that spanned both banks that required us to portage. It too was really easy to get around thanks to the low grassy banks. Needless to say, we didn’t like the gross abundance of development along, well, almost everywhere. Really, except for the first half-mile or so leading to Nagawicka Road, you’ll be surrounded by development for this entire trip. It’s lake country in Waukesha County; houses are everywhere – often large, pricey ones at that. But we knew this would be the case ahead of time, so it didn’t come as a surprise. Shortly after portaging around the Lake Nagawicka dam in Delafield you’ll encounter an absurdly low pipeline that traverses the river in swift current. This used to feed a fish hatchery with water, but we’re not sure if it’s still used for that these days. Regardless, the pipeline is still there. It’s rare to catch this stretch of the Bark River at high water levels anyway (70+ cfs), so paddlers in kayaks should be OK getting underneath (canoeists would probably need to portage around it). But the current is strong here, so be careful. Why the damn thing is so close to the water in the first place is anyone’s guess. And if it serves no functional purpose anymore, why it’s still there is another guess. Generally speaking, we don’t like violating ordinances or breaking the law (unless they’re really dumb and/or we have no reasonable alternative). We’re nice guys. We’re not necessarily complacent, but we try to be compliant. But paying a fee to use a boat launch, as a canoeist or kayaker, is one of those dumb ones. First off, expecting a paddler to pay to share space with motorboats and Jet-Skis on an overdeveloped lake is, well, [expletive deleted] ludicrous. Sorry, but that’s just a fact. Paddling is a right, not a privilege. 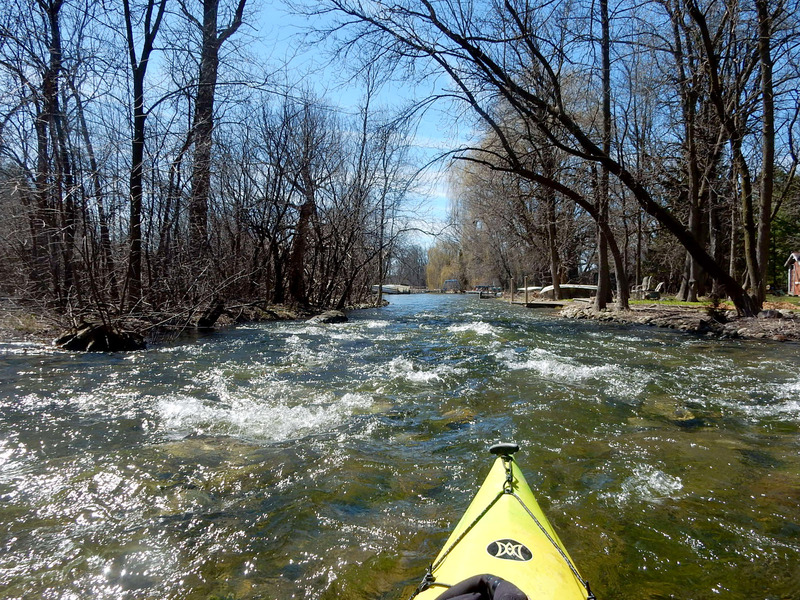 Keeping lake water-levels high enough via artificial damming of a river – that paddlers have to portage around – is a privilege for the combustible engine crowd. No paddler is asking for that, only the motorized folks. We also don’t require concrete boat launches, usually accustomed to putting-in or taking-out at bridges in bumfudge nowhere. Let’s be real. As paddlers, we’d gladly pay to partake in the scheduled releases of dams for whitewater play – even though our paddling druthers is that dams be removed in the first place – but we get that something or someone is going out of the way for our recreational benefit, and that it probably costs money for that to happen. We’ll pay our fair share for that, sure. But a boat launch for barge-like pontoons? Yeah, no. OK, not to get all legalese here, but it’s the language “to reasonably appear to have been abandoned” that’s relevant. First off, the car was there for exactly 2.5 hours, from noon to 2:30 pm. Secondly, it was parked on the shoulder as far away from the road as possible, next to a bridge. Thirdly, short of having a license plate that reads “LV2PDL” or “PADDLR” or “IPADDLE,” my car really couldn’t be more conspicuous about its relationship to paddling. Indeed, it’s a car with a roof rack for hauling kayaks parked next to a bridge over a river. We’re all for plausible deniability, but slapping a sticker – that doesn’t peel off cleanly, but instead leaves your mirror with residue paper and sticky goo – on such a car in such a location that was there for 2.5 hours, seriously?!? Had it been left there for the whole day or overnight, then OK, fine. But during a sunny Friday afternoon? C’mon! We really enjoyed this trip – and we really enjoyed portions of the trip we did last year. So, next time around we’d start in downtown Hartland at Bark Park, about 2.2 miles upstream of Highway 83, and take-out at the public boat launch on Lower Nemahbin. That would make for a great trip! You’d have public access, facilities and free parking at both locations – shockingly rare in Waukesha County – plus you’d get a longer trip, more river and less lake at that. 5.8 miles by car, slightly shorter by bicycle – thanks to the Lake Country Trail. Putting in a short distance downstream from Highway 83. Very secluded section for the first 1/2 mile. The water clarity is simply stunning. Some obstacles to dodge, but the current here is gentle. This tree we had to portage around, but it was easy. Minor riffles momentarily above and below the Nagawicka Road bridge. Houses (and a barn) appear below Nagawicka Road. Another broken tree (with a passable slot through it). Residential area leading to Lake Nagawicka. Blurry picture, but this is an albino squirrel – a first. Kind of corny, but still appreciated. Coming upon the inlet to Lake Nagawicka. Ladies and gentlemen, Lake Nagawicka. Mergansers and some other shy duck. The northern tip of the lake has a rugged look to it. Looking south, that’s Lapham Peak State Park on the right mound. There are some ginormous houses on or overlooking the lake. This actually is a real heron; we thought it was a decoy. The colors of this house are pretty fabulous. The portage around the dam is easy. That’s where you’ll get out. Looking eastward at the dam. Pretty modest dam, all things considered. Even on the lake, the water clarity is fantastic. River left, pond right (part of St. John’s Park) – below the dam. N. Genesee Road/aka County Road C.
The current really picks up between the two lakes. Annoyingly low pipeline that may or may not still feed water to a fish hatchery. Very serene setting past public land on both banks. Vestige from river’s more industrial past. Cushing Park Road (after which riffles and light rapids will really begin to pick up). …And below the bridge too. A residential area resumes as you approach Upper Nemahbin Lake. You’d never know from the photo that the interstate highway is just on the left. So long Upper Nemahbin Lake! Underneath Delafield Road, looking ahead at the westbound bridge of I-94. The public boat ramp at Delafield Road, where we took out. Super easy, but worth the day use cost? Finding my “abandoned” car at the Highway 83 bridge. Give me a break Hartland PD.